"D-Day" redirects here. This article is about the first day of the Invasion of Normandy. The subsequent operations are covered in Invasion of Normandy. 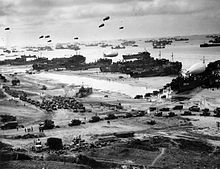 For the use of D-Day as a general military term, see D-Day (military term). For other uses, see D-Day (disambiguation). "Operation Neptune" redirects here. For other uses, see Operation Neptune (disambiguation). After the German Army invaded the Soviet Union in June 1941, the Soviet leader Joseph Stalin began pressing his new allies for the creation of a second front in western Europe. In late May 1942 the Soviet Union and the United States made a joint announcement that a "... full understanding was reached with regard to the urgent tasks of creating a second front in Europe in 1942." However, British Prime Minister Winston Churchill persuaded US President Franklin D. Roosevelt to postpone the promised invasion as, even with US help, the Allies did not have adequate forces for such an activity. Instead of an immediate return to France, the western Allies staged offensives in the Mediterranean Theatre of Operations, where British troops were already stationed. By mid-1943 the campaign in North Africa had been won. The Allies then launched the invasion of Sicily in July 1943, and subsequently invaded the Italian mainland in September the same year. By then, Soviet forces were on the offensive and had won a major victory at the Battle of Stalingrad. 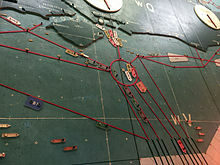 The decision to undertake a cross-channel invasion within the next year was taken at the Trident Conference in Washington in May 1943. Initial planning was constrained by the number of available landing craft, most of which were already committed in the Mediterranean and Pacific. At the Tehran Conference in November 1943, Roosevelt and Churchill promised Stalin that they would open the long-delayed second front in May 1944. Four sites were considered for the landings: Brittany, the Cotentin Peninsula, Normandy, and the Pas-de-Calais. As Brittany and Cotentin are peninsulas, it would have been possible for the Germans to cut off the Allied advance at a relatively narrow isthmus, so these sites were rejected. With the Pas-de-Calais being the closest point in continental Europe to Britain, the Germans considered it to be the most likely initial landing zone, so it was the most heavily fortified region. But it offered few opportunities for expansion, as the area is bounded by numerous rivers and canals, whereas landings on a broad front in Normandy would permit simultaneous threats against the port of Cherbourg, coastal ports further west in Brittany, and an overland attack towards Paris and eventually into Germany. Normandy was hence chosen as the landing site. The most serious drawback of the Normandy coast—the lack of port facilities—would be overcome through the development of artificial Mulberry harbours. A series of specialised tanks, nicknamed Hobart's Funnies, were created to deal with conditions expected during the Normandy Campaign, such as scaling sea walls and providing close support on the beach. The Allies planned to launch the invasion on 1 May 1944. The initial draft of the plan was accepted at the Quebec Conference in August 1943. General Dwight D. Eisenhower was appointed commander of Supreme Headquarters Allied Expeditionary Force (SHAEF). General Bernard Montgomery was named as commander of the 21st Army Group, which comprised all of the land forces involved in the invasion. On 31 December 1943 Eisenhower and Montgomery first saw the plan, which proposed amphibious landings by three divisions with two more divisions in support. 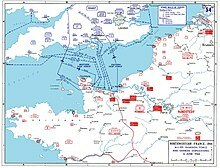 The two generals immediately insisted that the scale of the initial invasion be expanded to five divisions, with airborne descents by three additional divisions, to allow operations on a wider front and speed up the capture of Cherbourg. The need to acquire or produce extra landing craft for the expanded operation meant that the invasion had to be delayed to June. Eventually, thirty-nine Allied divisions would be committed to the Battle of Normandy: twenty-two US, twelve British, three Canadian, one Polish, and one French, totalling over a million troops all under overall British command. Operation Overlord was the name assigned to the establishment of a large-scale lodgement on the Continent. The first phase, the amphibious invasion and establishment of a secure foothold, was codenamed Operation Neptune. To gain the air superiority needed to ensure a successful invasion, the Allies undertook a bombing campaign (codenamed Operation Pointblank) that targeted German aircraft production, fuel supplies, and airfields. Elaborate deceptions, codenamed Operation Bodyguard, were undertaken in the months leading up to the invasion to prevent the Germans from learning the timing and location of the invasion. The landings were to be preceded by airborne operations near Caen on the eastern flank to secure the Orne River bridges and north of Carentan on the western flank. 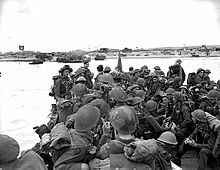 The Americans, assigned to land at Utah Beach and Omaha Beach, were to attempt to capture Carentan and St. Lô the first day, then cut off the Cotentin Peninsula and eventually capture the port facilities at Cherbourg. The British at Sword and Gold Beaches and Canadians at Juno Beach would protect the US flank and attempt to establish airfields near Caen. A secure lodgement would be established and an attempt made to hold all territory north of the Avranches-Falaise line within the first three weeks. Montgomery envisaged a ninety-day battle, lasting until all Allied forces reached the River Seine. Under the overall umbrella of Operation Bodyguard, the Allies conducted several subsidiary operations designed to mislead the Germans as to the date and location of the Allied landings. Operation Fortitude included Fortitude North, a misinformation campaign using fake radio traffic to lead the Germans into expecting an attack on Norway, and Fortitude South, a major deception involving the creation of a fictitious First United States Army Group under Lieutenant General George S. Patton, supposedly located in Kent and Sussex. Fortitude South was intended to deceive the Germans into believing that the main attack would take place at Calais. Genuine radio messages from 21st Army Group were first routed to Kent via landline and then broadcast, to give the Germans the impression that most of the Allied troops were stationed there. Patton was stationed in England until 6 July, thus continuing to deceive the Germans into believing a second attack would take place at Calais. Many of the German radar stations on the French coast were destroyed in preparation for the landings. In addition, on the night before the invasion, a small group of Special Air Service (SAS) operators deployed dummy paratroopers over Le Havre and Isigny. These dummies led the Germans to believe that an additional airborne landing had occurred. On that same night, in Operation Taxable, No. 617 Squadron RAF dropped strips of "window", metal foil that caused a radar return which was mistakenly interpreted by German radar operators as a naval convoy near Le Havre. The illusion was bolstered by a group of small vessels towing barrage balloons. A similar deception was undertaken near Boulogne-sur-Mer in the Pas de Calais area by No. 218 Squadron RAF in Operation Glimmer. The invasion planners determined a set of conditions involving the phase of the moon, the tides, and the time of day that would be satisfactory on only a few days in each month. A full moon was desirable, as it would provide illumination for aircraft pilots and have the highest tides. 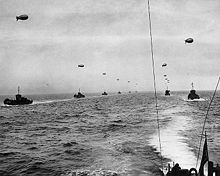 The Allies wanted to schedule the landings for shortly before dawn, midway between low and high tide, with the tide coming in. This would improve the visibility of obstacles on the beach, while minimising the amount of time the men would be exposed in the open. 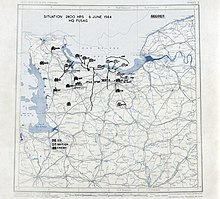 Eisenhower had tentatively selected 5 June as the date for the assault. However, on 4 June, conditions were unsuitable for a landing: high winds and heavy seas made it impossible to launch landing craft, and low clouds would prevent aircraft from finding their targets. Group Captain James Stagg of the Royal Air Force (RAF) met Eisenhower on the evening of 4 June. He and his meteorological team predicted that the weather would improve enough for the invasion to proceed on 6 June. The next available dates with the required tidal conditions (but without the desirable full moon) would be two weeks later, from 18 to 20 June. Postponement of the invasion would have required recalling men and ships already in position to cross the Channel, and would have increased the chance that the invasion plans would be detected. 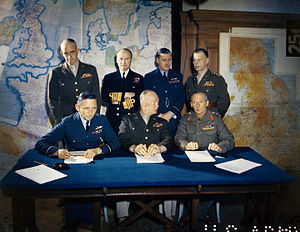 After much discussion with the other senior commanders, Eisenhower decided that the invasion should go ahead on the 6th. A major storm battered the Normandy coast from 19 to 22 June, which would have made the beach landings impossible. Allied control of the Atlantic meant German meteorologists had less information than the Allies on incoming weather patterns. As the Luftwaffe meteorological centre in Paris was predicting two weeks of stormy weather, many Wehrmacht commanders left their posts to attend war games in Rennes, and men in many units were given leave. Field Marshal Erwin Rommel returned to Germany for his wife's birthday and to meet with Hitler to try to obtain more Panzers. 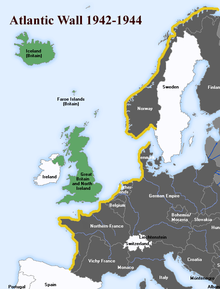 Nazi Germany had at its disposal fifty divisions in France and the Low Countries, with another eighteen stationed in Denmark and Norway. Fifteen divisions were in the process of formation in Germany. Combat losses throughout the war, particularly on the Eastern Front, meant that the Germans no longer had a pool of able young men from which to draw. German soldiers were now on average six years older than their Allied counterparts. Many in the Normandy area were Ostlegionen (eastern legions) – conscripts and volunteers from Russia, Mongolia, and other areas of the Soviet Union. They were provided mainly with unreliable captured equipment and lacked motorised transport. Many German units were under strength. 709th Static Infantry Division under Generalleutnant Karl-Wilhelm von Schlieben numbered 12,320 men, many of them Ostlegionen (non-German conscripts recruited from Soviet prisoners of war, Georgians and Poles). 352nd Infantry Division under Generalleutnant Dietrich Kraiss, a full-strength unit of around 12,000 brought in by Rommel on 15 March and reinforced by two additional regiments. 21st Panzer Division, (south of Caen) under Generalmajor Edgar Feuchtinger included 146 tanks and 50 assault guns, plus supporting infantry and artillery. 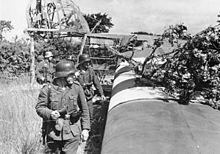 Alarmed by the raids on St Nazaire and Dieppe in 1942, Hitler had ordered the construction of fortifications all along the Atlantic coast, from Spain to Norway, to protect against an expected Allied invasion. He envisioned 15,000 emplacements manned by 300,000 troops, but shortages, particularly of concrete and manpower, meant that most of the strongpoints were never built. As it was expected to be the site of the invasion, the Pas de Calais was heavily defended. In the Normandy area, the best fortifications were concentrated at the port facilities at Cherbourg and Saint-Malo. Rommel was assigned to oversee the construction of further fortifications along the expected invasion front, which stretched from the Netherlands to Cherbourg, and was given command of the newly re-formed Army Group B, which included the 7th Army, the 15th Army, and the forces guarding the Netherlands. Reserves for this group included the 2nd, 21st, and 116th Panzer divisions. Rommel believed that the Normandy coast could be a possible landing point for the invasion, so he ordered the construction of extensive defensive works along that shore. In addition to concrete gun emplacements at strategic points along the coast, he ordered wooden stakes, metal tripods, mines, and large anti-tank obstacles to be placed on the beaches to delay the approach of landing craft and impede the movement of tanks. 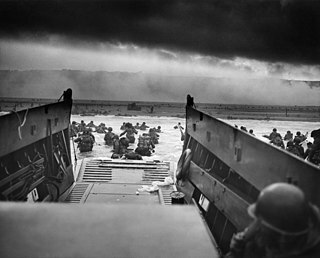 Expecting the Allies to land at high tide so that the infantry would spend less time exposed on the beach, he ordered many of these obstacles to be placed at the high water mark. Tangles of barbed wire, booby traps, and the removal of ground cover made the approach hazardous for infantry. On Rommel's order, the number of mines along the coast was tripled. The Allied air offensive over Germany had crippled the Luftwaffe and established air supremacy over western Europe, so Rommel knew he could not expect effective air support. The Luftwaffe could muster only 815 aircraft over Normandy in comparison to the Allies' 9,543. Rommel arranged for booby-trapped stakes known as Rommelspargel (Rommel's asparagus) to be installed in meadows and fields to deter airborne landings. Rommel believed that Germany's best chance was to stop the invasion at the shore. He requested that the mobile reserves, especially tanks, be stationed as close to the coast as possible. Rundstedt, Geyr, and other senior commanders objected. They believed that the invasion could not be stopped on the beaches. Geyr argued for a conventional doctrine: keeping the Panzer formations concentrated in a central position around Paris and Rouen and deploying them only when the main Allied beachhead had been identified. He also noted that, in the Italian Campaign, the armoured units stationed near the coast had been damaged by naval bombardment. Rommel's opinion was that, because of Allied air supremacy, the large-scale movement of tanks would not be possible once the invasion was under way. Hitler made the final decision, which was to leave three Panzer divisions under Geyr's command and give Rommel operational control of three more as reserves. Hitler took personal control of four divisions as strategic reserves, not to be used without his direct orders. Overall, the Second Army contingent consisted of 83,115 men, 61,715 of them British. The nominally British air and naval support units included a large number of personnel from Allied nations, including several RAF squadrons manned almost exclusively by overseas air crew. For example, the Australian contribution to the operation included a regular Royal Australian Air Force (RAAF) squadron, nine Article XV squadrons, and hundreds of personnel posted to RAF units and RN warships. The RAF supplied two-thirds of the aircraft involved in the invasion. 79th Armoured Division: Major General Percy Hobart provided specialised armoured vehicles which supported the landings on all beaches in Second Army's sector. The resistance was alerted to carry out these tasks by messages personnels transmitted by the BBC's French service from London. Several hundred of these messages, which might be snatches of poetry, quotations from literature, or random sentences, were regularly transmitted, masking the few that were actually significant. In the weeks preceding the landings, lists of messages and their meanings were distributed to resistance groups. An increase in radio activity on 5 June was correctly interpreted by German intelligence to mean that an invasion was imminent or underway. However, because of the barrage of previous false warnings and misinformation, most units ignored the warning. Naval operations for the invasion were described by historian Correlli Barnett as a "never surpassed masterpiece of planning". In overall command was British Admiral Sir Bertram Ramsay, who had served as Flag officer at Dover during the Dunkirk evacuation four years earlier. He had also been responsible for the naval planning of the invasion of North Africa in 1942, and one of the two fleets carrying troops for the invasion of Sicily the following year. The invasion fleet, which was drawn from eight different navies, comprised 6,939 vessels: 1,213 warships, 4,126 landing craft of various types, 736 ancillary craft, and 864 merchant vessels. The majority of the fleet was supplied by the UK, which provided 892 warships and 3,261 landing craft. In total there were 195,700 naval personnel involved; of these 112,824 were from the Royal Navy with another 25,000 from the Merchant Navy, 52,889 were American, and 4,998 sailors from other allied countries. The invasion fleet was split into the Western Naval Task Force (under Admiral Alan G Kirk) supporting the US sectors and the Eastern Naval Task Force (under Admiral Sir Philip Vian) in the British and Canadian sectors. Available to the fleet were five battleships, 20 cruisers, 65 destroyers, and two monitors. German ships in the area on D-Day included three torpedo boats, 29 fast attack craft, 36 R boats, and 36 minesweepers and patrol boats. The Germans also had several U-boats available, and all the approaches had been heavily mined. At 05:10, four German torpedo boats reached the Eastern Task Force and launched fifteen torpedoes, sinking the Norwegian destroyer HNoMS Svenner off Sword beach but missing the battleships HMS Warspite and Ramillies. After attacking, the German vessels turned away and fled east into a smoke screen that had been laid by the RAF to shield the fleet from the long-range battery at Le Havre. Allied losses to mines included USS Corry off Utah and USS PC-1261, a 173-foot patrol craft. In addition, many landing craft were lost. The success of the amphibious landings depended on the establishment of a secure lodgement from which to expand the beachhead to allow the buildup of a well-supplied force capable of breaking out. The amphibious forces were especially vulnerable to strong enemy counter-attacks before the arrival of sufficient forces in the beachhead could be accomplished. To slow or eliminate the enemy's ability to organise and launch counter-attacks during this critical period, airborne operations were used to seize key objectives such as bridges, road crossings, and terrain features, particularly on the eastern and western flanks of the landing areas. The airborne landings some distance behind the beaches were also intended to ease the egress of the amphibious forces off the beaches, and in some cases to neutralise German coastal defence batteries and more quickly expand the area of the beachhead. The US 82nd and 101st Airborne Divisions were assigned to objectives west of Utah Beach, where they hoped to capture and control the few narrow causeways through terrain that had been intentionally flooded by the Germans. 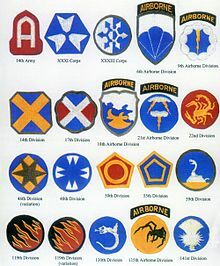 Reports from Allied intelligence in mid-May of the arrival of the German 91st Infantry Division meant the intended drop zones had to be shifted eastward and to the south. 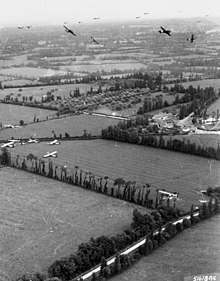 The British 6th Airborne Division, on the eastern flank, was assigned to capture intact the bridges over the Caen Canal and River Orne, destroy five bridges over the Dives 6 miles (9.7 km) to the east, and destroy the Merville Gun Battery overlooking Sword Beach. 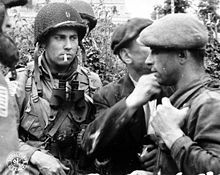 Free French paratroopers from the British SAS Brigade were assigned to objectives in Brittany from 5 June until August in Operations Dingson, Samwest, and Cooney. The US airborne landings began with the arrival of pathfinders at 00:15. Navigation was difficult because of a bank of thick cloud, and as a result only one of the five paratrooper drop zones was accurately marked with radar signals and Aldis lamps. Paratroopers of the US 82nd and 101st Airborne Divisions, numbering over 13,000 men, were delivered by Douglas C-47 Skytrains of the IX Troop Carrier Command. To avoid flying over the invasion fleet, the planes arrived from the west over the Cotentin Peninsula and exited over Utah Beach. Reinforcements arrived by glider around 04:00 (Mission Chicago and Mission Detroit), and 21:00 (Mission Keokuk and Mission Elmira), bringing additional troops and heavy equipment. Like the paratroopers, many landed far from their drop zones. Even those that landed on target experienced difficulty, with heavy cargo such as Jeeps shifting during landing, crashing through the wooden fuselage, and in some cases crushing personnel on board. The first Allied action of D-Day was Operation Deadstick, a glider assault at 00:16 at Pegasus Bridge over the Caen Canal and the bridge (since renamed Horsa Bridge) over the Orne, half a mile (800 metres) to the east. Both bridges were quickly captured intact, with light casualties, by members of the 5th Parachute Brigade and the 7th (Light Infantry) Parachute Battalion. The five bridges over the Dives were destroyed with minimal difficulty by the 3rd Parachute Brigade. Meanwhile, the pathfinders tasked with setting up radar beacons and lights for further paratroopers (scheduled to begin arriving at 00:50 to clear the landing zone north of Ranville) were blown off course, and had to set up the navigation aids too far east. Many paratroopers, also blown too far east, landed far from their intended drop zones; some took hours or even days to be reunited with their units. Major General Richard Gale arrived in the third wave of gliders at 03:30, along with equipment, such as antitank guns and jeeps, and more troops to help secure the area from counter-attacks, which were initially staged only by troops in the immediate vicinity of the landings. At 02:00, the commander of the German 716th Infantry Division ordered Feuchtinger to move his 21st Panzer Division into position to counter-attack. However, as the division was part of the armoured reserve, Feuchtinger was obliged to seek clearance from OKW before he could commit his formation. Feuchtinger did not receive orders until nearly 09:00, but in the meantime on his own initiative he put together a battle group (including tanks) to fight the British forces east of the Orne. Only 160 men out of the 600 members of the 9th Battalion tasked with eliminating the enemy battery at Merville arrived at the rendezvous point. Lieutenant Colonel Terence Otway, in charge of the operation, decided to proceed regardless, as the emplacement had to be destroyed by 06:00 to prevent it firing on the invasion fleet and the troops arriving on Sword Beach. In the Battle of Merville Gun Battery, Allied forces disabled the guns with plastic explosives at a cost of 75 casualties. The emplacement was found to contain 75 mm guns rather than the expected 150 mm heavy coastal artillery. Otway's remaining force withdrew with the assistance of a few members of the 1st Canadian Parachute Battalion. With this action, the last of the D-Day goals of the British 6th Airborne Division was achieved. 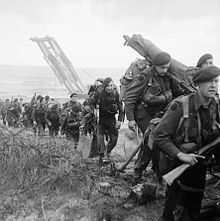 They were reinforced at 12:00 by commandos of the 1st Special Service Brigade, who landed on Sword Beach, and by the 6th Airlanding Brigade, who arrived in gliders at 21:00 in Operation Mallard. Some of the landing craft had been modified to provide close support fire, and self-propelled amphibious Duplex-Drive tanks (DD tanks), specially designed for the Normandy landings, were to land shortly before the infantry to provide covering fire. However, few arrived in advance of the infantry, and many sank before reaching the shore, especially at Omaha. Utah Beach was in the area defended by two battalions of the 919th Grenadier Regiment. Members of the 8th Infantry Regiment of the 4th Infantry Division were the first to land, arriving at 06:30. Their landing craft were pushed to the south by strong currents, and they found themselves about 2,000 yards (1.8 km) from their intended landing zone. This site turned out to be better, as there was only one strongpoint nearby rather than two, and bombers of IX Bomber Command had bombed the defences from lower than their prescribed altitude, inflicting considerable damage. In addition, the strong currents had washed ashore many of the underwater obstacles. The assistant commander of the 4th Infantry Division, Brigadier General Theodore Roosevelt, Jr., the first senior officer ashore, made the decision to "start the war from right here", and ordered further landings to be re-routed. Pointe du Hoc, a prominent headland situated between Utah and Omaha, was assigned to two hundred men of 2nd Ranger Battalion, commanded by Lieutenant Colonel James Rudder. 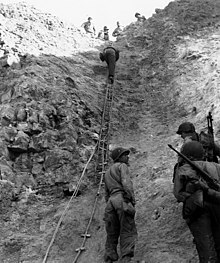 Their task was to scale the 30m (100ft) cliffs with grappling hooks, ropes, and ladders to destroy the coastal gun battery located at the top. The cliffs were defended by the German 352nd Infantry Division and French collaborators firing from above. Allied destroyers Satterlee and Talybont provided fire support. After scaling the cliffs, the Rangers discovered that the guns had already been withdrawn. They located the weapons, unguarded but ready to use, in an orchard some 550 metres (600 yd) south of the point, and disabled them with explosives. The now-isolated Rangers fended off numerous counter-attacks from the German 914th Grenadier Regiment. The men at the point became isolated and some were captured. By dawn on D+1, Rudder had only 90 men able to fight. Relief did not arrive until D+2, when members of the 743rd Tank Battalion and others arrived. By then, Rudder's men had run out of ammunition and were using captured German weapons. Several men were killed as a result, because the German weapons made a distinctive noise, and the men were mistaken for the enemy. By the end of the battle, the Rangers casualties were 135 dead and wounded, while German casualties were 50 killed and 40 captured. An unknown number of French collaborators were executed. 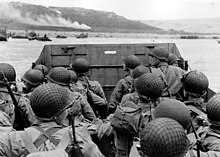 US assault troops in an LCVP landing craft approach Omaha Beach, 6 June 1944. Omaha, the most heavily defended beach, was assigned to the 1st Infantry Division and 29th Infantry Division. They faced the 352nd Infantry Division rather than the expected single regiment. Strong currents forced many landing craft east of their intended position or caused them to be delayed. For fear of hitting the landing craft, US bombers delayed releasing their loads and, as a result, most of the beach obstacles at Omaha remained undamaged when the men came ashore. 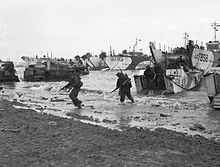 Many of the landing craft ran aground on sandbars and the men had to wade 50-100m in water up to their necks while under fire to get to the beach. In spite of the rough seas, DD tanks of two companies of the 741st Tank Battalion were dropped 5,000 yards (4,600 m) from shore; however, 27 of the 32 flooded and sank, with the loss of 33 crew. Some tanks, disabled on the beach, continued to provide covering fire until their ammunition ran out or they were swamped by the rising tide. 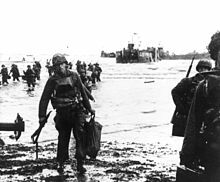 The first landings on Gold beach were set for 07:25 due to the differences in the tide between there and the US beaches. High winds made conditions difficult for the landing craft, and the amphibious DD tanks were released close to shore or directly on the beach instead of further out as planned. Three of the four guns in a large emplacement at the Longues-sur-Mer battery were disabled by direct hits from the cruisers Ajax and Argonaut at 06:20. The fourth gun resumed firing intermittently in the afternoon, and its garrison surrendered on 7 June. Aerial attacks had failed to hit the Le Hamel strongpoint, which had its embrasure facing east to provide enfilade fire along the beach and had a thick concrete wall on the seaward side. Its 75 mm gun continued to do damage until 16:00, when a modified Armoured Vehicle Royal Engineers (AVRE) tank fired a large petard charge into its rear entrance. A second casemated emplacement at La Rivière containing an 88 mm gun was neutralised by a tank at 07:30. Meanwhile, infantry began clearing the heavily fortified houses along the shore and advanced on targets further inland. The No. 47 (Royal Marine) Commando moved toward the small port at Port-en-Bessin and captured it the following day in the Battle of Port-en-Bessin. Company Sergeant Major Stanley Hollis received the only Victoria Cross awarded on D-Day for his actions while attacking two pillboxes at the Mont Fleury high point. On the western flank, the 1st Battalion, Hampshire Regiment captured Arromanches (future site of Mulberry "B"), and contact was made on the eastern flank with the Canadian forces at Juno. Bayeux was not captured the first day due to stiff resistance from the 352nd Infantry Division. Allied casualties at Gold Beach are estimated at 1,000. The landing at Juno was delayed because of choppy seas, and the men arrived ahead of their supporting armour, suffering many casualties while disembarking. Most of the offshore bombardment had missed the German defences. Several exits from the beach were created, but not without difficulty. At Mike Beach on the western flank, a large crater was filled using an abandoned AVRE tank and several rolls of fascine, which were then covered by a temporary bridge. The tank remained in place until 1972, when it was removed and restored by members of the Royal Engineers. The beach and nearby streets were clogged with traffic for most of the day, making it difficult to move inland. Major German strongpoints with 75 mm guns, machine-gun nests, concrete fortifications, barbed wire, and mines were located at Courseulles-sur-Mer, St Aubin-sur-Mer, and Bernières-sur-Mer. The towns themselves also had to be cleared in house-to-house fighting. Soldiers on their way to Bény-sur-Mer, 3 miles (5 km) inland, discovered that the road was well covered by machine gun emplacements that had to be outflanked before the advance could proceed. Elements of the 9th Canadian Infantry Brigade advanced to within sight of the Carpiquet airfield late in the afternoon, but by this time their supporting armour was low on ammunition so the Canadians dug in for the night. The airfield was not captured until a month later as the area became the scene of fierce fighting. By nightfall, the contiguous Juno and Gold beachheads covered an area 12 miles (19 km) wide and 7 miles (10 km) deep. Casualties at Juno were 961 men. On Sword, 21 of 25 DD tanks of the first wave were successful in getting safely ashore to provide cover for the infantry, who began disembarking at 07:30. The beach was heavily mined and peppered with obstacles, making the work of the beach clearing teams difficult and dangerous. In the windy conditions, the tide came in more quickly than expected, so manoeuvring the armour was difficult. The beach quickly became congested. Brigadier Simon Fraser, 15th Lord Lovat and his 1st Special Service Brigade arrived in the second wave, piped ashore by Private Bill Millin, Lovat's personal piper. Members of No. 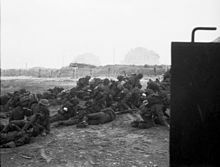 4 Commando moved through Ouistreham to attack from the rear a German gun battery on the shore. A concrete observation and control tower at this emplacement had to be bypassed and was not captured until several days later. French forces under Commander Philippe Kieffer (the first French soldiers to arrive in Normandy) attacked and cleared the heavily fortified strongpoint at the casino at Riva Bella, with the aid of one of the DD tanks. The 'Morris' strongpoint near Colleville-sur-Mer was captured after about an hour of fighting. The nearby 'Hillman' strongpoint, headquarters of the 736th Infantry Regiment, was a large complex defensive work that had come through the morning's bombardment essentially undamaged. It was not captured until 20:15. The 2nd Battalion, King's Shropshire Light Infantry began advancing to Caen on foot, coming within a few kilometres of the town, but had to withdraw due to lack of armour support. At 16:00, the 21st Panzer Division mounted a counter-attack between Sword and Juno and nearly succeeded in reaching the Channel. It met stiff resistance from the British 3rd Division and was soon recalled to assist in the area between Caen and Bayeux. Estimates of Allied casualties on Sword Beach are as high as 1,000. Victory in Normandy stemmed from several factors. German preparations along the Atlantic Wall were only partially finished; shortly before D-Day Rommel reported that construction was only 18 per cent complete in some areas as resources were diverted elsewhere. The deceptions undertaken in Operation Fortitude were successful, leaving the Germans obliged to defend a huge stretch of coastline. The Allies achieved and maintained air supremacy, which meant that the Germans were unable to make observations of the preparations underway in Britain and were unable to interfere via bomber attacks. Infrastructure for transport in France was severely disrupted by Allied bombers and the French Resistance, making it difficult for the Germans to bring up reinforcements and supplies. Some of the opening bombardment was off-target or not concentrated enough to have any impact, but the specialised armour worked well except on Omaha, providing close artillery support for the troops as they disembarked onto the beaches. Indecisiveness and an overly complicated command structure on the part of the German high command were also factors in the Allied success. At Omaha Beach, parts of the Mulberry harbour are still visible, and a few of the beach obstacles remain. A memorial to the US National Guard sits at the location of a former German strongpoint. Pointe du Hoc is little changed from 1944, with the terrain covered with bomb craters and most of the concrete bunkers still in place. The Normandy American Cemetery and Memorial is nearby, in Colleville-sur-Mer. A museum about the Utah landings is located at Sainte-Marie-du-Mont, and there is one dedicated to the activities of the US airmen at Sainte-Mère-Église. Two German military cemeteries are located nearby. Pegasus Bridge, a target of the British 6th Airborne, was the site of some of the earliest action of the Normandy landings. The bridge was replaced in 1994 by one similar in appearance, and the original is now housed on the grounds of a nearby museum complex. Sections of Mulberry Harbour B still sit in the sea at Arromanches, and the well-preserved Longues-sur-Mer battery is nearby. The Juno Beach Centre, opened in 2003, was funded by the Canadian federal and provincial governments, France, and Canadian veterans. ^ The official British history gives an estimated figure of 156,115 men landed on D-Day. This comprised 57,500 Americans and 75,215 British and Canadians from the sea and 15,500 Americans and 7,900 British from the air. Ellis, Allen & Warhurst 2004, pp. 521–533. ^ The original estimate for Allied casualties was 10,000, of which 2,500 were killed. Research under way by the National D-Day Memorial has confirmed 4,414 deaths, of which 2,499 were American and 1,915 were from other nations. Whitmarsh 2009, p. 87. ^ a b c Ford & Zaloga 2009, p. 25. ^ a b Beevor 2009, p. 76. ^ a b c d Beevor 2009, p. 82. ^ Ford & Zaloga 2009, pp. 60, 63, 118–120. ^ Zaloga & Johnson 2005, p. 29. ^ Napier 2015, p. 72. ^ a b c d e f g Portsmouth Museum Services. ^ Churchill 1951, p. 404. ^ Whitmarsh 2009, pp. 12–13. ^ a b c d e Whitmarsh 2009, p. 13. ^ a b Ellis, Allen & Warhurst 2004, pp. 521–533. ^ a b Beevor 2009, p. 3. ^ a b Beevor 2009, Map, inside front cover. ^ Weinberg 1995, p. 698. ^ Whitmarsh 2009, p. 27. ^ a b c d e Whitmarsh 2009, p. 31. ^ a b Whitmarsh 2009, p. 33. ^ Wilmot 1997, p. 224. ^ Francois 2013, p. 118. ^ Ford & Zaloga 2009, p. 118. ^ a b c Ford & Zaloga 2009, p. 122. ^ Ford & Zaloga 2009, pp. 60, 63. ^ a b c d e Ford & Zaloga 2009, p. 63. ^ a b c d e f g h Ford & Zaloga 2009, p. 275. ^ Ford & Zaloga 2009, p. 60. ^ a b Ford & Zaloga 2009, p. 206. ^ Goldstein, Dillon & Wenger 1994, p. 12. ^ Murray 1983, p. 263. ^ Murray 1983, p. 280. ^ Hooton 1999, p. 283. ^ a b c Whitmarsh 2009, Map, p. 12. ^ a b c d e Ford & Zaloga 2009, p. 125. ^ Whitmarsh 2009, p. 53. ^ a b Ford & Zaloga 2009, p. 66. ^ a b Holland 2014. ^ a b Ford & Zaloga 2009, p. 271. ^ a b Ford & Zaloga 2009, p. 270. ^ a b c Ford & Zaloga 2009, p. 200. ^ Ford & Zaloga 2009, p. 201. ^ Douthit 1988, p. 23. ^ Escott 2010, p. 138. ^ Beevor 2009, p. 43. ^ Wilmot 1997, p. 229. ^ Special Operations Research Office 1965, pp. 51–52. ^ Yung 2006, p. 133. ^ a b Goldstein, Dillon & Wenger 1994, p. 6. ^ Morison 1962, p. 67. ^ Whitmarsh 2009, p. 30. ^ Ford & Zaloga 2009, p. 205. ^ Ford & Zaloga 2009, p. 233. ^ Weigley 1981, pp. 136–137. ^ a b Wilmot 1997, p. 275. ^ Wilmot 1997, p. 255. ^ Goldstein, Dillon & Wenger 1994, p. 82. ^ Beevor 2009, pp. 81, 117. ^ Whitmarsh 2009, pp. 51–52, 69. ^ Ford & Zaloga 2009, p. 114. ^ Wilmot 1997, p. 175. ^ Ford & Zaloga 2009, p. 125, 128–129. ^ Wilmot 1997, p. 234. ^ Corta 1952, p. 159. ^ Corta 1997, pp. 65–78. ^ a b Ford & Zaloga 2009, p. 133. ^ Ford & Zaloga 2009, p. 134. ^ Beevor 2009, p. 27. ^ a b Wilmot 1997, p. 243. ^ Beevor 2009, pp. 61–64. ^ Beevor 2009, p. 116. ^ Ford & Zaloga 2009, p. 139. ^ Beevor 2009, p. 67. ^ a b Wilmot 1997, p. 244. ^ Ford & Zaloga 2009, p. 145. ^ Beevor 2009, p. 69. ^ Ford & Zaloga 2009, pp. 149–150. ^ Ford & Zaloga 2009, p. 151. ^ Beevor 2009, p. 71. ^ Ford & Zaloga 2009, p. 167. ^ Wilmot 1997, p. 246–247. ^ Beevor 2009, pp. 52–53. ^ Wilmot 1997, pp. 238–239. ^ Wilmot 1997, p. 240. ^ Beevor 2009, p. 57. ^ Wilmot 1997, p. 239. ^ Ford & Zaloga 2009, p. 222. ^ Ford & Zaloga 2009, p. 228, 230. ^ Beevor 2009, pp. 56–58. ^ Wilmot 1997, p. 242. ^ Ford & Zaloga 2009, Map, pp. 216–217. ^ Goldstein, Dillon & Wenger 1994, p. 84. ^ a b Ford & Zaloga 2009, p. 73. ^ Ford & Zaloga 2009, p. 130. ^ Ford & Zaloga 2009, pp. 131, 160–161. ^ Whitmarsh 2009, pp. 50–51. ^ Ford & Zaloga 2009, pp. 158–159, 164. ^ Ford & Zaloga 2009, p. 165. ^ a b Beevor 2009, p. 102. ^ Wilmot 1997, p. 263. ^ Beevor 2009, p. 155. ^ Zaloga 2009, p. 50. ^ Beevor 2009, p. 106. ^ Ford & Zaloga 2009, pp. 76–77. ^ a b Beevor 2009, p. 91. ^ Beevor 2009, p. 90. ^ Beevor 2009, p. 99. ^ Ford & Zaloga 2009, pp. 333–334. ^ a b Ford & Zaloga 2009, pp. 56, 83. ^ Ford & Zaloga 2009, pp. 276–277. ^ Ford & Zaloga 2009, p. 299. ^ Ford & Zaloga 2009, p. 286. ^ Ford & Zaloga 2009, pp. 298–299. ^ Wilmot 1997, p. 272. ^ Ford & Zaloga 2009, p. 292. ^ a b Whitmarsh 2009, p. 70. ^ Ford & Zaloga 2009, pp. 289–290. ^ Beevor 2009, p. 129. ^ Wilmot 1997, pp. 272–273. ^ Wilmot 1997, pp. 274–275. ^ Ford & Zaloga 2009, pp. 312–313. ^ Ford & Zaloga 2009, Map, p.314–315. ^ Ford & Zaloga 2009, p. 317. ^ Beevor 2009, pp. 133–135. ^ Beevor 2009, p. 135. ^ Wilmot 1997, p. 276. ^ Wilmot 1997, p. 277. ^ Ford & Zaloga 2009, pp. 239–240. ^ a b Beevor 2009, p. 143. ^ Beevor 2009, p. 138. ^ a b Ford & Zaloga 2009, pp. 244–245. ^ Ford & Zaloga 2009, pp. 248–249. ^ Beevor 2009, p. 74. ^ Whitmarsh 2009, p. 104. ^ Flint 2009, p. 102. ^ Flint 2009, p. 336. ^ Ford & Zaloga 2009, p. 346. ^ Ford & Zaloga 2009, pp. 346–348. ^ Ford & Zaloga 2009, p. 352. ^ Zuehlke 2004, pp. 349–350. "D-Day and the Battle of Normandy: Your Questions Answered". Portsmouth Museum Services. Archived from the original on 21 June 2013. Retrieved 18 April 2014. Douthit, Howard L. III (1988). The Use and Effectiveness of Sabotage as a Means of Unconventional Warfare- An Historical Perspective from World War I Through Vietnam (PDF) (M.Sc. thesis). Wright-Patterson Air Force Base, Ohio: Air Force Institute of Technology. Retrieved 8 April 2014. Ellis, L.F.; Allen, G.R.G. ; Warhurst, A.E. (2004) . Butler, J.R.M (ed.). Victory in the West, Volume I: The Battle of Normandy. History of the Second World War United Kingdom Military Series. London: Naval & Military Press. ISBN 978-1-84574-058-0. Holland, James (5 June 2014). "D-Day: Exploding the myths of the Normandy landings". CNN. Morison, Samuel Eliot (1962). History of United States Naval Operations in World War II. 11. The invasion of France and Germany, 1944–1945. Boston: Little, Brown. OCLC 757924260. Murray, Williamson (1983). Strategy for Defeat: The Luftwaffe, 1933–45. Washington: Brassey's. ISBN 978-1-57488-125-7. "Pegasus Bridge: The Bridge of the Longest Day". Mémorial Pegasus D-Day Commemoration Committee. Retrieved 7 April 2014. Staff (5 June 2014). "D-Day: In the words of the BBC journalists". BBC News. Retrieved 10 June 2014. Stanley, Peter (6 June 2004). "Australians and D-Day". Anniversary talks. Australian War Memorial. Retrieved 26 April 2014. Weigley, Russell F. (1981). Eisenhower's Lieutenants: The Campaign of France and Germany 1944–1945. I. Bloomington, Indiana: Indiana University Press. ISBN 978-0-253-13333-5. Zaloga, Steven J; Johnson, Hugh (2005). D-Day Fortifications in Normandy. Oxford; New York: Osprey. ISBN 978-1-4728-0382-5. Buckley, John (2006). The Normandy Campaign: 1944: Sixty Years On. London; New York: Routledge. ISBN 978-1-134-20303-1. Holderfield, Randal J.; Varhola, Michael J. (2001). The Invasion of Normandy, June 6, 1944. Mason City, Iowa: Savas. ISBN 978-1-882810-45-1. Keegan, John (1994). Six Armies in Normandy: From D-Day to the Liberation of Paris. New York: Penguin Books. ISBN 978-0-14-023542-5. Milton, Giles (2018). D-Day: The Soldiers' Story. London: John Murray. ISBN 978-1473649019. Ryan, Cornelius (1959). The Longest Day. New York: Simon & Schuster. ISBN 978-0-671-20814-1. Stacey, C.P. (1960). Volume III. The Victory Campaign, The Operations in North-West Europe 1944–1945 (PDF). Official History of the Canadian Army in the Second World War. Ottawa: Department of National Defence. Zetterling, Niklas (2000). Normandy 1944: German Military Organisation, Combat Power and Organizational Effectiveness. Winnipeg: J.J. Fedorowicz Publishing. ISBN 978-0-921991-56-4. Wikivoyage has a travel guide for D-Day beaches. Boire, Michael (2003). "Lest We Forget: A Review of Books Marking the 60th Anniversary of D-Day". Canadian Military Journal. 5 (2). This page was last edited on 26 April 2019, at 00:58 (UTC).